Coverage: Live commentary on BBC Radio 5 Live Sports Extra, BBC Sport website and BBC Sport app, plus live text commentary. Swansea-born Imad Wasim is looking forward to returning to Wales as Pakistan take on England in Sunday's final one-day international in Cardiff. The 27-year-old became Pakistan's first Wales-born player in July, 2015. He said: "I'm looking forward to seeing that place as well because I haven't been there for a while. I just went (back) there once. I'm looking forward to playing in Cardiff." 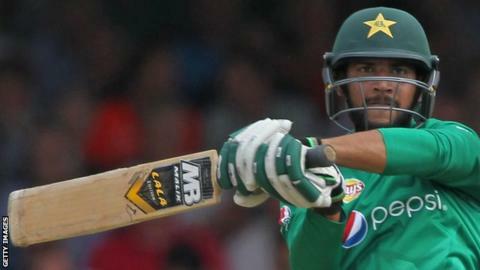 Pakistan trail England 4-0 despite Imad hitting 57 off 41 balls at Headingley. Imad may have been born in south-west Wales, within a few miles of Glamorgan and England stars such as Robert Croft, Simon Jones and Greg Thomas, but there was never a prospect of him wearing the daffodil or Three Lions. His parents emigrated to Swansea for work, but returned to Pakistan while Imad was a young child and before he had a chance to bat or bowl on the playing fields of the city. "My father had a job there, he's an engineer," said Imad, who learnt his cricket in Islamabad, progressing to the national under-19 side and the provincial team. He returned to the UK for spells in the Lancashire leagues with Burnley and Accrington, but it was via the cricket backwater of the Instonians club in Belfast that he was summoned to the senior national T20 and one-day squads in 2015. "I came to England and Ireland to play some league cricket. I'm a true Pakistani, but just I was born in Wales." As a useful lower-order batsman and left-arm spinner, Imad earned a call-up to the star-studded Jamaica Tallawahs squad which won the 2016 Caribbean Premier League, alongside the likes of West Indies' Chris Gayle and Sri Lanka's Kumar Sangakkara. He opened the bowling at times alongside South Africa paceman Dale Steyn, fresh from a stint with Glamorgan, and claimed three crucial wickets in the final against Guyana. Pakistan's one-day match against Ireland in August 2016 saw Imad return his best international figures of five for 14, but his main contributions against England have been with the bat. Unbeaten half-centuries in the ODIs at Lord's and Headingley mean he has scored 137 runs in three matches without being out. He chipped in with the wickets of Alex Hales and captain Eoin Morgan at Lord's, before dismissing Ben Stokes at Headingley as England claimed a fourth one-day win and the summer's Super Series honours across all formats. When the SSE Swalec Stadium was re-developed, few would have expected the first Welsh-born player to take the field there in an international to be sporting the green of Pakistan. But Imad is now one of the key men in the tourists' effort to claim a consolation win.